Despite nearly 40 years of isolation from each other and of the numerous conflicts between the United States and Cuba, Puerto Ricans and Cubans still maintain strong bonds. These resilient bonds are in part a result of their shared colonial history, topography, climate, language, music, food, ethnic mix and culture to name a few. Even their national flags (the standards of their wars of independence from Spain) share the same basic design and colors. Though direct contact between the islands became minimal after 1961, bonds between the inhabitants of both islands have remained strong, and interest in commercial opportunities in Cuba in a post-embargo scenario is high in Puerto Rico. This aim of this paper is to provide a holistic context in which to examine this likely commercial relationship. This contextual framework takes into account the effects that politics, economics, transitional business strategies and cultural bonds might have in a rapprochement between the islands. A review of previous studies on the likely commercial relation between a post-embargo Cuba and Puerto Rico, and of current economic data on both islands, was supplemented with personal interviews with business people and government officials in both Puerto Rico and Cuba. It should be noted, however, that the paper focuses more on the strengths and weaknesses of Puerto Rico as a competitor in the Cuban market, given that any kind of commercial exchange is bound to benefit Cuba. Findings suggest that there will be some trade and investment diversion for Puerto Rico, as well as trade creation and new foreign direct investment opportunities for both islands. Key commercial exchange sectors appear to be professional services, tourism, manufacturing, construction, agriculture and small business. The findings also suggest that the behavior of some economic sectors will respond primarily to the demands of globalization, while others might offer a more local focus of control. The paper sheds light on the process of considerable change facing not only the Cuban political economy, but the Puerto Rican one as well. During the Cold War, and particularly after the triumph of the 1959 Cuban revolution, the United States provided both incentives and deterrents to nations in the Americas as a way to enlist support for its policy of containment of communism in the region. In the Caribbean, for example, the “carrots” included a vast array of economic incentives such as the Caribbean Basin Initiative (CBI).5 The deterrents or “sticks” included the embargo on Cuba, as well as the overt and covert support of numerous other “anticommunist” groups in other countries. Puerto Rico became the focus of the carrots and Cuba the focus of the sticks. While Puerto Rico received generous financial and technical assistance, welfare benefits, and preferential tax treatments as an incentive for industrialization, Cuba was embargoed, invaded, isolated and politically and economically undermined in a systematic way. Given the climate of U.S hostility towards Cuba and towards any real or imagined “other Cuba,” it is not surprising that the preeminent objective of Cuba’s foreign policy towards the Caribbean6 during the Cold War was strategic, and focused on defense (González Núñez 1991). González Núñez further suggests that a second set of objectives of Cuba policy towards the Caribbean during the Cold War era was based on the achievement of “common” regional goals: (1) freedom from U.S. hegemony; (2) economic and political integration of the Caribbean with Latin American: and (3) the struggle to achieve a new international economic order that guarantied the development of the Caribbean. The cause of Puerto Rican independence was seen by the Cuban government as a strategic component of this set of foreign policy objectives. To the great irritation of the United States, Cuba conducted its diplomatic battles against U.S. colonial influence in Puerto Rico primarily, in two international forums such as the United Nations’ Non-Aligned Bloc and the General Assembly’s Special Committee on Decolonization. As a result of this political-economic polarization of the region, the relationship between Puerto Rico and Cuba, in essence, became a “non- relationship” (no trade, minimal official contact, etc.) circumscribed by the narrow parameters of the U.S. embargo, as well as by the strategic and defense interests of the United States. AND WHEN THE EMBARGO ENDS? The business, academic and government papers produced in Puerto Rico bear some resemblance to those produced in the United States, though the breadth and the depth of Cuba knowledge of the former is not as well developed as the latter. Puerto Rico-produced documents also tend to emphasize economic analysis and thus lack the business-oriented detail of many of the sectoral opportunity analyses produced in the United States. Both U.S. mainland- and Puerto Rico-based studies, do tend to err perhaps on the “triumphalist” side, minimizing the role of the foreign business enclave already established in Cuba and of the emerging Cuban managerial class while at the same time exaggerating the advantages of its own business establishment. In the case of both sets of reports, the fact that the opportunity analysis is predicated on such unpredictable events as the end of the U.S. embargo, which in turn is predicated on changes within the Castro regime, makes the opportunities, by-and-large, hypothetical. In other words, the time frame for the reports to become “actionable” is unknown. Despite the embargo, many U.S.-based companies have already staked out their territories in Cuba and some are even operating legally either overtly (e.g. AT&T as well as many companies in the information and culture sectors10), or covertly through joint ventures in third countries, not to mention those that are in violation of the embargo. Associations such as the U.S.-Cuba Trade and Economic Council, the Cuba- Caribbean Development Corporation, and Alamar Associates have conducted fairly regular trade junkets to the island and numerous memoranda of understanding have been signed by potential future partners. Several Puerto Rican law firms have taken on the Cuba business promotion role and are actively encouraging their clients to prepare contingency plans that include actions which they can legally undertake at present within the parameters of the embargo (e.g. registering trademarks and trading in certain commodities). There have also been a number of formal and informal business delegations to Cuba, as well as Cuban delegations which have been invited to attend business conferences held on Puerto Rican soil.11 According to Coto-Ojeda (Casellas 1999), approximately one hundred Puerto Rican business people visited Cuba on business trips in 1998, paralleling some of the business development moves of U.S.- based firms. The enthusiasm of U.S. and Puerto Rican business people is obviously being fueled by projections of future opportunities reported in local and international studies. For example, estimates of bilateral U.S.- Cuba trade point to a possible value of U.S. $3,000- 7,000 million in the first few years of the normalization of relations. Given the value of the potential market, even minor cracks in the embargo, such as the easing of controls on food and agricultural sales to Cuba announced by the Clinton Administration in January of 1999, create a great deal of interest in U.S.12 and Puerto Rican business sectors.13 Unfortunately, taking advantage of these opportunities in the current political climate of Cuba and within the narrow definition of what is allowable within the parameters of the U.S. embargo, will be very difficult. Given the likely role of the Puerto Rico based Cuban exile community is likely to play in a post-embargo scenario, a brief look at its characteristics can serve as one of the predictors of the nature of the future commercial relationship between Cuba and Puerto Rico. The Cuban exile community in Puerto Rico is the second largest Cuban exile community after Miami. The 1990 Puerto Rican Census found 19,736 persons born in Cuba (a decline from previous Census figures suggesting a net out migration of exiles to the United States). According to Cobas and Duany (1995), this exile group distinguishes itself from the Cuban exile groups in United States in number of ways. A smaller and more highly stratified (socially, economically, educationally and racially) segment of the exile community took residence in Puerto Rico. In the 1990s, the level of education and the median income of Puerto Rico-based Cuban exiles is higher than that of Puerto Ricans. By-and-large, the exiles were able to successfully establish themselves in commercial, managerial and professional occupations. Many are self-employed and many hold important positions in exile-owned, Puerto Rican and foreign firms. Despite their economic influence, however, Cuban exiles in Puerto Rico have not developed the level of political clout over local or U.S. mainland politics that their U.S. based counterparts have. Since the Cuban exiles faced less language, cultural and religious differences, they have been able to integrate quite well into Puerto Rican society, though they tend to concentrate in the upper middle classes. Overall, Puerto Rican-Cuban exile relations have been generally positive, though at times there has been conflict over the economic competition that the exiles presented, as well as over ideological differences, and the right of Cuban exiles to vote in political plebiscites. Cobas and Duany further suggest that both exiled Cuban and Puerto Rican business people have expressed their interest in participating in the re-construction of Cuba though many might do so via investment rather than a return to Cuba. Puerto Ricobased exiles are likely to present a fair amount of competition to similar groups based in the United States (primarily Florida and New Jersey) in their capacity as managers, investors and entrepreneurs (maybe less then they think, but more than their U.S. counterparts think). The Puerto Rico-based Cuban exile community, in its majority, vigorously supports the U.S. embargo. Promoting any business contact with Cuba while the Castro regime is still in power remains a delicate matter in San Juan. The threat of business boycotts and of violence against businesses or persons by the Cuban exile community is a reality one must contend with if operating a Cuba-related venture (even if legal within the parameters of the embargo) out of Puerto Rico. In sum, Cuba and Puerto Rico are still playing their parts in the Cold War—a war that is by all intents and purposes, over. 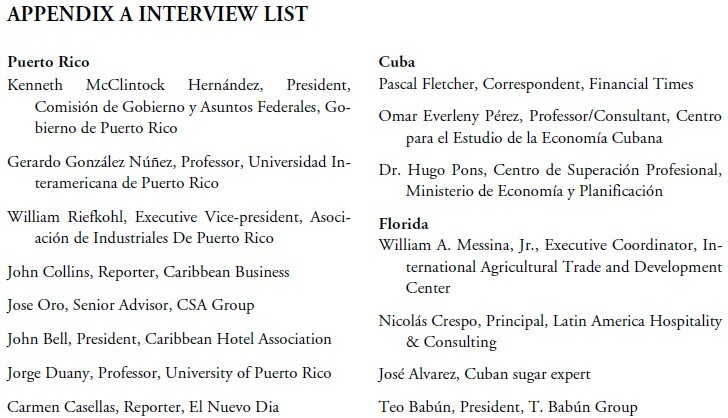 As far as indicators within Cuba of interest in establishing commercial ties with Puerto Rico, the main evidence of such interest has been the reception of the Puerto Rican commercial delegations that have visited Cuba and the attempts to send Cuban delegations to commercial events in Puerto Rico. There is very little empirical field research focusing on Cuba’s managerial class and its commercial interests given the sensitive nature of this information in the eyes of the Cuban government. However, one study was identified which, though somewhat dated (it was conducted before the majority of Cuba economic reforms were put in place) could act as proxy for the views of Cuban managers on the topics of future commercial relations with the Caribbean and with Puerto Rico. In a study on Cuban empresarios (managers) conducted in 1994 and 1995, González Núñez (1997) cited a number of perceived obstacles to Cuba’s commercial integration in the Caribbean. First of all, the empresarios thought that their knowledge of trade opportunities was limited, and up-to-date and reliable market intelligence sources were not available to them. Respondents also pointed out further obstacles to commercial relations such as a lack of commercial infrastructure and maritime transportation. The need to modernize and “marketize” the Cuban enterprises model was also mentioned. Though infrastructure and managerial know-how have improved considerably since the publication of the González Núñez paper, they are still not sufficient to make Cuba either an attractive market or an industrial location. When queried about countries of commercial interest in the Caribbean, the majority of Cuban empresarios responded that the Dominican Republic and Jamaica would be of most interest to them. Those in Havana tended to favor the western Caribbean while those in Santiago de Cuba, the Eastern Caribbean. Puerto Rico was not one of the countries mentioned by the empresarios in the González Núñez study when ranking their commercial interest in either in the Caribbean Basin overall or in the Eastern Caribbean. Obviously the U.S. embargo would not permit the actual establishment of trade at this point, but it is interesting to note that while Puerto Rican business people, academics and government official ponder the impact on Puerto Rico of Cuba’s re-integration, Cuban empresarios do not seem to think much about it at all. Interviews conducted for this research paper confirm the notion that the relative importance of Puerto Rico for Cuba is much less than that of Cuba for Puerto Rico. Some of the major differences between the Cuba of the early 1990s, when most of the Puerto Rico-authored reports mentioned earlier were completed, and the Cuba of 1999, are: (1) timid signs of recovery by the Cuban economy more market responsiveness by certain sectors; (2) implementation of a moderate set of market reforms, though there are no clear indications of further reforms on the horizon; (3) stabilization of the Cuban managerial elite in both business (e.g. joint ventures, state enterprises etc.) and government spheres; (4) competition from other countries has made deep inroads in some of the more attractive sectors of the Cuban economy such as tourism, mining, tobacco, power generation, construction and real estate, and telecommunications; and (5) in a regional context, Cuba’s trade association obligations with CARICOM (Caribbean Commonwealth Association) and the Association of Caribbean States (ACS) countries are likely to alter the priority ranking of Puerto Rican ventures vs. those of other Caribbean Basin partners. In other words, Cuba is no longer “virgin territory.” There are still opportunities, but they require much more sophisticated niche-oriented strategies and possible partnerships with other foreign firms. The largest unknown, of course, is the actual nature of Cuba’s post Castro political economy. Similarly, Puerto Rico has undergone changes. Key among these are: (1) heightened national debate over the political status of the island and a strong prostatehood agenda by the Roselló administration; (2) a hemispheric rather than Caribbean orientation; and (3) the phasing out of the Section 936 program14 and concerns over the possible erosion of the manufacturing base of the island. Though their findings are still generally applicable, the opportunity analysis of the aforementioned papers and reports produced in Puerto Rico in the early 1990s are at this point outdated. The next section of the paper will attempt to highlight a new set of dynamics that is likely to affect any commercial relationship between Cuba and Puerto Rico. The increased pace of globalization has altered the way in which Cuba-Puerto Rico competition and cooperation must be conceptualized. In other words, a number of sectors are more likely to respond to the vagaries of corporate global strategy than they are to any action taken by either local management or government policy makers. Tourism and manufacturing offer good examples. Puerto Rico’s manufacturing base is already facing strong competition not only from other Caribbean Basin countries such as the Dominican Republic, Mexico and Costa Rica, but also from Singapore, Ireland and Chile, among others. In terms of tourism, the Caribbean faces strong competition for the U.S. Northeast market from other “sun” destinations such as Florida’s Disney World and other family attractions being developed in the U.S. Southeast. In other words, globalization has changed the nature of competition. Puerto Rican and Cuban strategies aimed at taking advantage of the re-insertion of Cuba into the global economy must be looked at not only from a relatively static nation-to-nation standpoint, but also from that of the dynamic context of globalized corporate strategies. Thus, the increased need for business and government leaders to forge regional cooperative strategies to retain sectors such as manufacturing and tourism in their area. Global capital is also becoming a commodity. Countries vying for investment must offer ever improving rates of return, stability, transparency and greater manufacturing efficiency. The development of a thriving post-embargo commercial relationship between Cuba and Puerto Rico will also depend, in large part, on the nature of the established trade and investment patterns of each island, who their major trade and investment partners are, and where their comparative advantages lie. Though a thorough analysis of the trade patterns of Cuba and Puerto Rico is beyond the scope of this paper, a look at the relationships of each country within the Caribbean Basin can provide a context in which to understand the dynamics of their bilateral trade relationships in a post-embargo scenario. Despite Cuba’s regional (Caribbean and hemispheric- wide) trade creating efforts of the late 1990s, intraregional trade remains low. Cuba’s most important commercial partners for trade and investment— Canada, Spain and Italy—are outside the region. Within a Caribbean Basin context, Cuba’s Caribbean trade is significant only with the Dutch Antilles, Mexico and Venezuela. Cuba’s revolutionary government had in many occasions manifested its interest in establishing some sort of link with CARICOM countries. However, it was unable to do so to a great extent because of U.S. pressure to keep Cuba isolated (González Núñez 1991). The 1990s, however, heralded a new era of Cuba- Caribbean relations, not due to any change of heart on the part of the United States, but to the efforts of Caribbean nations, particularly those in CARICOM. This movement towards the re-integration of Cuba into the Caribbean is concurrent with Cuba’s efforts to re-insert itself into the hemisphere and into the global economy. Cuba is, nevertheless, still not a member of the Organization of American States and of the major international financial institutions as a result of continuing U.S. pressure to isolate the Castro regime. Given Cuba’s size, its highly educated and trainable labor force, and geographic location, it is foreseeable that Cuba may try to become a major hub of commercial activity in the region once relations with the United States are normalized and the re-construction of its transportation and industrial infrastructure is undertaken. Cuba is also actively pursuing the development of multi-destination tourism involving other Caribbean islands. Puerto Rico’s trading relationship with its Caribbean neighbors has never been particularly important when compared with its trading relationship with the United States. In 1997, for example, total trade between the United States and Puerto Rico amounted to U.S. $4.5 billion, accounting for 76 percent of the island’s total trade. The Caribbean represented only 4.5 percent of Puerto Rico’s trade (the Dominican Republic being the major partner) and the rest of Latin America amounted to only 2.9 percent of Puerto Rico’s total trade (CEPAL 1998). In Latin America, Puerto Rico has commercial offices in the Dominican Republic, Mexico, Costa Rica, Panama, Brazil, Chile and Argentina. Many of these offices are less than five years old and show Puerto Rico’s recent hemispheric trade commitment (Montano 1999). In general, Puerto Rico’s Caribbean orientation seems to ebb and flow with the vagaries of U.S. policy initiatives towards the Caribbean, as well as with its own local electoral politics. The status option (Commonwealth, Statehood or Independence) proposed by the party in power in San Juan at a given point in time appears to form the nucleus of Puerto Rico’s conception of its “foreign” and commercial policy towards the Caribbean, the hemisphere, and the world. As succinctly put by Sir Neville Nichols, president of the Caribbean Development Bank, “Puerto Rico runs hot or cold in its relations with CARICOM, depending on what Party is in power in San Juan” (quoted in Collins 1998). In sum, an analysis of Puerto Rico’s and Cuba’s commercial priorities in the Caribbean basin and in the hemisphere, suggests that while Puerto Rico is moving away from a Caribbean policy and towards a hemispheric policy, Cuba is forging closer relations with both its Caribbean neighbors as well as with the rest of Latin America (though it could be argued that Cuba is willing to join any commercial club that will have it as a member). Puerto Rico’s hemispheric orientation also stands in sharp contrast to the intense alliance-building currently under way in most Caribbean Basin nations. This analysis suggests that Governor Roselló is perhaps dealing with Puerto Rico’s strategic and commercial interests as if the island were already the 51st state of the United States. Therefore, he does not see the need to align Puerto Rico with the interests of Caribbean Basin trading blocs, and would rather align Puerto Rico only with the hemispheric partnerships that the U.S. belongs to as a nation (FTA and NAFTA). This policy alignment is perhaps more of a political maneuver aimed more at gaining favor in the United States for Puerto Rican statehood status, than at increasing trade. As mentioned in the introductory section of this paper, most of the opportunity analysis that follows is done from the point of view of Puerto Rican investment and trade interests. A post-embargo Cuba, accompanied by an economic reform-minded government, can only hope to gain from any Puerto Rican trade and investment. On the other hand, the impact on Puerto Rico of Cuba’s re-integration in the region will provide both opportunities and threats and thus merits a more careful analysis. The interviews conducted for this study revealed that the general perception of Puerto Rico’s competitive advantage in the Cuban market is that Puerto Ricans have a somewhat hybrid business culture, part North American and part Latin American. The North American part would give Puerto Ricans an edge over other Latin Americans because Puerto Rican managers and entrepreneurs usually speak English (the U.S. being Cuba’s natural market), work with U.S. business methods and practices, and most importantly, have comparatively easy access to U.S. credit institutions. The Latin American part would give them an edge over their North American competitors because Puerto Ricans would share Cubans’ language, culture and sense of history. Compared to the Miami exiles, who will be formidable competitors, exiles in Puerto Rico are less ghettoized and more integrated into the Puerto Rican business structure. They would, therefore, perhaps be able to take part in Cuban opportunities in mixed (exile-Puerto Rican) teams and thus conceivably be perceived as less threatening to Cubans than their Miami counterparts. In terms of sharing the spoils, there is a perception in Miami that the old Puerto Rican connection with eastern Cuba will rebound while Miami-based businesses would concentrate on Western Cuba (Babún quoted in Collins 1996). The González Núñez study also suggests a greater interest in the Oriental part of Cuba in the Eastern Caribbean. However, interviews conducted for this paper in Puerto Rico did not reveal a geographical-historical basis for determining the relative competitive advantages between both sets of exiles, but rather a sectoral one. A number of factors will affect Puerto Rico’s competitive standing. For the first few years after the embargo is lifted (assuming a pro-market Cuban government), Cuba will have to focus primarily on a number of questions: (1) how to “digest” the impact of U.S. market forces and U.S. companies vying for Cuban markets; (2) how to manage its re-integration in the world of international commercial credit; and (3) and how to balance its commercial relations with its existing partners. Puerto Rico will be only a small bit player in this transition. Another factor affecting Puerto Rican ventures negatively will be the Cuban predilection for embarking upon large projects and for dealing with large corporate partners (grandismo). At present, Cuba needs everything; cannot afford to pay for much; and there are many companies already competing for the business. In a post-embargo scenario, even more goods and services will be needed; hopefully more money will be available through foreign investment, growth in the national economy and new credits; and there will be even more competitors. Among them, the most formidable one, the United States. Thus the analysis of opportunities and threats for Puerto Rico presented below restricts itself to the sectors where some clear advantage to Puerto Rico-based firms is present. This, of course, does not preclude firms in any other sector finding the right niche either directly or indirectly through association with a Cuban or foreign firm. There is a general consensus that the sectors of most interest to Puerto Rican business people in a postembargo Cuba would be: professional services, construction, manufacturing, small and medium size business, tourism and agriculture.15 Most sectors should provide excellent opportunities for Puerto Rican firms participating in Cuba’s redevelopment, generally a win-win scenario. However, the redevelopment of Cuba’s tourism and agriculture sectors could provide a threat to Puerto Rico. Professional, technical, financial and managerial services: This is perhaps one of the greatest areas of opportunity for Puerto Rico. Puerto Rican white collar workers are likely participate in Cuba’s reconstruction as managers in U.S., foreign or Puerto Rican owned firms. Puerto Rican managers enjoy a high level of preparation in a number of sectors that will be in high demand. Moreover, as already mentioned, their American-Latin hybrid business culture should provide a competitive advantage over their U.S.-based and Latin American counterparts for the reasons stated earlier. However, it is not yet clear if the Puerto Rican managerial class could successfully compete with Miami-based exiles and with U.S. and foreign managers, given that it has never had to test its mettle against these rivals. As stated in the 1994 Government of Puerto Rico report (1994, p. 7), Puerto Rico could benefit from its experience in sectors such as “research and development, general and financial consultancy, design and construction of industrial facilities.” Upper and middle managers, as well as technical and support personnel in all manufacturing sectors and in all areas of ancillary services, are likely to encounter opportunities as Cuban manufacturing and industrial sectors are developed. There will be a great need for the services of professional service firms in areas such as marketing, law, accounting, business and technical services, etc. There will also be opportunities for small, specialized schools that can provide technical, vocational and business training (hair salons, electronic and technological repairs, auto-body shops, secretarial training, etc.). The Puerto Rican financial sector would also stand to gain from a normalized Cuba. Banks with already established fund transfer networks in the region could simply open a node in Cuba to serve their clients. Puerto Rican clients will also need various kinds of funding for trade and investment purposes in Cuba which can be provided by a Puerto Rico-based financial institutions. Real estate will offer some of the most attractive opportunities: “the country’s needs are clear: infrastructure, housing, hotels, retailing, offices, factories as well as facilities in the new free-trade zones all require major infusions of capital” (Haines 1997). Though there has been some liberalization in this sector and there are a number of foreign- financed projects under way, the Cuban government is still quite hesitant to fully open this sector. Moreover, the property claims settlement process with U.S. based claimants cannot take place until the embargo is lifted. The good news for Puerto Rico is that there will be many opportunities left when the embargo lifts. The competition, however will be fierce and contingency plans that are actionable on short notice are needed. The telecommunications sector is often cited as one which could offer opportunities for Puerto Rican companies. However, two factors are likely to dampen this enthusiasm. First, since the last set of Puerto Rico-based Cuban opportunity analysis reports were published, the Puerto Rican telephone company has been privatized and now belongs to a U.S. firm. Thus, the key to a Puerto Rican participation in this sector in Cuba will be the lobbying efforts of Puerto Rico based executives in favor of a corporate expansion strategy managed out of Puerto Rico rather than out of U.S. headquarters (or Miami). And second, major portions of the Cuban telecommunications sector are already in the hands of U.S., Italian and Canadian competitors. Nevertheless, these facts would not preclude the provision of ancillary goods and services, nor the formation of joint ventures. Construction: Construction and infrastructure development, including transportation and power, are attractive sectors in Cuba. Though there are strong competitors already established in Cuba (e.g., Canadian companies built the Havana airport), a major construction boom is likely to occur once international financial institutions (IFIs) begin to finance these projects. The types of real estate projects described earlier would all have a construction component. The provision of materials for construction could also provide good prospects. Between 1995 and 1998, Puerto Rico’s construction sector has grown by over 50 percent and it is expected to continue growing (Villamil 1999). This experience, combined with that gained from the construction of recent megaprojects (e.g., urban train and super aqueduct) should help position Puerto Rican construction firms well for competition in Cuba. While Miami has refurbished much of its Art Deco architecture, Puerto Rico has done a spectacular job of refurbishing its colonial buildings in the Old San Juan area. This experience should be of great value in bidding for jobs to reconstruct old Havana and many other colonial cities in Cuba. However, given the traditional large size of projects financed by the IFIs, Puerto Rican companies in these sectors would be well advised to begin to search for partners to bid with. Manufacturing: Both Cuba and Puerto Rico aligned their economies to suit the commercial needs of their respective hegemonic powers. While Cuba deepened its monoculture and traded sugar for oil and manufactures with COMECON (Council for Mutual Economic Assistance) countries, Puerto Rico developed a strong manufacturing base for export to the United States as a result of preferential trade policies and beneficial federal tax structures. The result is that while Cuba has a small and generally obsolete manufacturing base (mostly concentrated on light manufacturing and sugar processing), Puerto Rico has a large and modern one. Within Cuba’s manufacturing Jurassic Park, however, the biotechnology sector stands out as a jewel—it is the most advanced in Latin America. Another plus is Cuba’s labor force since it is as well educated and healthy as Puerto Rico’s, though in great need of retraining. Cuba will need to scrap most of its existing plant, modernize some of it, and diversify into many more sectors. Thus many opportunities will be available. Cuba is not expected to present a threat to Puerto Rican manufacturers, but rather a number of opportunities. The basic logic that will determine how large Puerto Rican-based U.S.-owned firms respond to these opportunities will most likely be that of globalized production, not of inter-island competition or cooperation. Moreover, the future of this sector in Puerto Rico once Section 936 benefits are completely phased out is unknown. What is clear, however, is that as Puerto Rican manufacturing specializes ever more on high tech products and wages rise, less skilled production is likely to be transferred out of Puerto Rico. But transferred where? Cuba will be only one manufacturing relocation contender among many others. Thus the strategy to secure a strong Puerto Rico-Cuba axis would require a twofold approach: (1) the Puerto Rican government must devise a new set of corporate incentives that can retain and increase the large U.S.-owned manufacturing base in Puerto Rico itself; and (2) Puerto Rico-based managers must begin to proactively develop plans for natural manufacturing linkages with Cuba that can convince stateside upper management of the merits of the expansion. One of the natural linkage sectors is likely to be pharmaceuticals. The combination of Puerto Rico expertise in manufacturing, and more recently in research and development, combined with Cuba’s strong base in biotechnology could provide opportunities for joint development and production of pharmaceuticals. However, the Puerto Rican manufacturing sector is being weakened by a combination of factors. The United States has experienced a decrease in industrial production, in part as a result of increased wage competition from less developed countries. This pattern has also affected Puerto Rico’s industrial base. For example, Mexico and the Dominican Republic have become strong regional competitors. Another factor affecting the sector is the loss of federal tax incentives for Puerto Rican plants such as section 936. There are, however, other federal and commonwealth incentives in place and new ones are being proposed.16 This loss of incentives is forcing corporations to reexamine Puerto Rico as an attractive industrial location and a launch pad for investment in other Caribbean islands and in Latin America. There are also opportunities for many smaller and criollo-owned (locally owned) firms. For example, there will be many opportunities for companies that supply intermediate products to whatever foreign owned large manufacturing companies establish themselves in Cuba, as they already do in Puerto Rico. As the Cuban market itself recuperates, Puerto Rican entrepreneurs could participate in the growth of import substitution opportunities (e.g., food processing, construction materials, etc.). The establishment of export-oriented plants would depend on whether inherent advantages to Cuban production can be found compared to production in other countries or in Puerto Rico itself. In 1999, Cuba’s free trade zones are hampered by the lack of a coherent set of incentives, a lack of investment in infrastructure and facilities, and a lack of access to its natural market—the United States. However, these zones could play a part in the long run in a competitive manufacturing, export or transshipment strategy that involves Cuba and Puerto Rico. Whether actual manufacturing plants are established by Puerto Rico-based firms or not, there is likely to be a fair amount of Puerto Rican investment participation in firms operated by Cubans or foreign nationals. As mentioned earlier, investment is one of the preferred business strategies of Cuban exiles living in Puerto Rico. Another variation that affects the Puerto Rican manufacturing base is whether Cuba can become an export market for their goods. Cuba will need all sorts of inputs for both industrial and consumer goods. It is not clear at this point, however, if Puerto Rican-produced goods would have a competitive advantage over U.S.- or foreign-manufactured products. The diversification of Puerto Rican trade away from its heavy reliance on the U.S. market and towards other Latin American and European markets would be a good preparatory stage for gaining competitive advantages in export markets. The fact that the activities of the Government of Puerto Rico’s commercial offices abroad will be re-focused towards Puerto Rican entrepreneurs (Montana 1999) should help prepare criollo traders. The interviews conducted for this study suggest that Puerto Ricans see opportunities in Cuba in the pharmaceutical, chemical machinery and equipment, and construction sectors. In sum, if markets can be secured (in and out of Cuba), if credit can be obtained, if Cuban wages and manufacturing costs can remain competitive, and if Cuban market reforms can create an attractive business climate—Cuba would be a natural place where to expand production. Whether specific Puerto Ricobased firms have a competitive advantage over foreign firms as manufacturers, investors or traders, is yet to be determined. Small and Medium-Sized Enterprises: Small business has become a main agent economic growth in Puerto Rico. As quoted in Caribbean Business, small businesses employ 75 percent of the private sector workforce in Puerto Rico and business with fewer than 50 employees represent 94.7 percent of total business establishments in the island (Caribbean Business Supplement, January 14, 1999; and Gigante 1999). Small business are highly represented in construction, manufacturing, services and retail. There are also a number of strong locally owned medium sized (by U.S. standards) enterprises. Their strength was recently demonstrated by an exercise conducted by the publication Caribbean Business (Lozana 1998). The publication merged the Hispanic Business Top 500 list of largest Hispanic-owned business in the U.S. with its own Caribbean Business Top 300 list of Puerto Rican-owned and based businesses. The result was that 249 of Caribbean Businesses Top 300 firms would have gained a spot in the Hispanic Business 500 list. Many of these firms are in financial services, wholesale and retail, manufacturing and food and beverage distribution. The strength and composition of Puerto Rico’s small and the medium size companies, along with the fact that they are criollo firms, augurs well for their participation Cuba’s redevelopment. Despite a host of new U.S. dollar-denominated retail stores, mostly in Havana, Cuba desperately needs a modern retail sector. Opportunities for foreign firms in this sector will be moderated by the fact that it is likely to remain a state monopoly as long as the Cuba government can keep it that way because the retail sector is a major source of revenue in pesos and foreign exchange for the Cuban state. There is a budding micro-enterprise sector (paladares, vending carts, etc.) which stand in contrast to these large state owned “sociedades anónimas.” There is currently some foreign presence in the wholesale sector. There will be great pressure to open the distribution and transportation sector in a post-embargo scenario. Major U.S. retailers will likely establish beachheads as the spending power of Cubans begins to rise, and Puerto Rican managers might find opportunities in this expansion. There will also be a vast number of possibilities for the type of Puerto Rican-owned small and medium size enterprises mentioned earlier. These would build up from the micro enterprise sector and down and around the state monopolies. An entire distribution and domestic transportation network for food, consumer and industrial goods will have to be developed. Yet again, the hybrid Latin/ U.S. nature of Puerto Rican retailers along with their access to U.S. supply chains and credit, should make expansion to or investment in Cuba feasible. Franchise operations—from food and clothing outlets, to gas stations, dry cleaners and copy centers—will also present many possibilities. The time to secure rights to Cuba would be now. Tourism: Cuba’s tourism assets are formidable. It possesses not only many unspoiled beaches, but also the possibility for many other kinds of tourism such as historical, ecological, mountain, and cultural. By 1998, tourism had become the driver of the Cuban economy, easily surpassing sugar as the main source of foreign exchange. In 1998, 1.4 million tourists visited the island bringing U.S. $1,800 million in earnings. Tourists came primarily from Canada, Germany, Italy, Spain, France, Great Britain, Mexico and Argentina. Given the cost and number of inputs required, however, some estimates suggests that 75 percent of tourist revenue is spent on inputs (Alfonso 1999). Moreover, occupancy rates are somewhat low except during high seasons and the average daily spending is still considerably low at U.S. $88.4/day (Alfonso 1999). Despite these obstacles, the industry is expected to continue growing at a fast pace and services and facilities are continually being upgraded. Cuba is re-positioning itself away from the low end budget travel segment towards the middle end, and aiming to move higher. Estimates for 1999 show a 20 percent in tourists, for a total of 1.7 million tourists. Cuba’s objective is to have 50,000 rooms by 2000. As prices go up, Cuba-based hotel chains are developing segmented offerings at a range of value levels. Foreign companies (primarily Canadian, Spanish, Dutch, Italian, Jamaican, French, German) are busily involved in making Cuba one of the fastest growing tourism destinations in the Americas. These companies are participating in Cuban tourism through direct investment and management contracts and through the provision of services such as airlines and tour packages. Cruise ships already have begun to dock in Havana. Several U.S. companies and hotel chains have plans in place once the U.S. travel ban ends. It is clear that Cuba would have to upgrade its facilities in order to meet U.S. standards and guest expectations (e.g., provide face towels). However, considering what Cuba has been able to accomplish in less than a decade of tourism development, the advent of true four- and five-star hotels that would suit American tastes is not far. Moreover, cruise lines would be able to add Cuban ports quickly by deploying much of the in-land tour infrastructure themselves (mini-buses for tours, meals onboard, etc.). Strategies to serve different niche markets at a range of value levels is likely to involve cross referencing of price/service segmentation with country of origin segmentation. Tourism is also a key driver of the Puerto Rican economy. According to a recent CLAA report (1999), in 1997 stay-over and cruise ship arrivals were up at 9.3 percent and 7.3 percent, respectively. That year, the total inventory of rooms was 10,571. The goal of the government’s Tourism Company is to increase that number to 16,000 rooms by the year 2000 (Sosa Pascual 1999). A new convention center is also under development. San Juan has become the largest home port for cruise ships in the Caribbean and the second largest home port for cruise ships in the world (CLAA 1999). Puerto Rican tourism tends to come from the U.S. East Coast, is upscale, and frequents four- and five-star hotels. While there is a fair amount of vacationers, and gambling-related tourism, there are also a considerable number of business travelers. The sector is dominated by U.S. hotel chains. The impact of lifting the U.S. travel ban to Cuba on Puerto Rico’s tourism sector is a great concern to Puerto Rican public and private sector agents. A Price Waterhouse study estimated that as many six million U.S. residents would visit Cuba annually if the travel restrictions were lifted (quoted in Haines 1997). It is reasonable to assume that some portion of these six million tourist would have otherwise visited Puerto Rico. The allure of forbidden fruit will create enormous demand for visits to Cuba during the first years of the lifting of the travel ban. As mentioned earlier, Cuba would have to upgrade its installation to please U.S. guests, particularly if it aims to have repeat visits. Everyday that the embargo is in place allows the Cuban government and its foreign partners to prepare a tourism infrastructure that can successfully and profitably receive the influx of U.S. tourists once the travel ban is lifted. Moreover, U.S. companies would be able to pick up some of the large established plant of tourist facilities in Cuba and quickly refurbish them. There will enormous pressure on large U.S. hotel chains to compete with these foreign hotel installations and with each other in the pursuit of beachheads in the Cuban market. Efforts to develop their Cuba product and garner market and margin share are likely to present a diversion of financial and managerial assets away from Puerto Rico and other Caribbean holdings. The silver lining in the cloud that a post-embargo Cuba would present to Puerto Rico is the likelihood that Cuba-bound tourism will increase the total number of visitors to the Caribbean. This would create opportunities for longer-stay, multi-island destination packages similar to those developed for the European holiday market. The increased interest in the Caribbean in the U.S. market should also help pull into the region some of the visitors lost to U.S. “sun” destinations. As increased demand drives prices in Cuba up, Puerto Rico could also attempt to penetrate Cuba’s current European market, not necessarily through lower prices, but through similar-priced offers providing better overall value. This effort would require better air connections to Europe. The catch, however, is that these strategies do not happen by themselves. Puerto Rican managers and government officials must take concrete steps to continually improve facilities and services in Puerto Rico, and actively pursue joint marketing possibilities. Agriculture: Before the 1959 Cuban revolution, both Cuba and Puerto Rico grew sugarcane and tobacco, among other crops. Unfortunately, the opportunities for Puerto Rican agricultural exporters that the break in relations between the U.S. and Cuba presented did not materialize (Alamo, no date). The U.S. government provided incentives to Louisiana and Florida sugar producers. In 1954-55, Puerto Rican and Cuban producers were the major exporters of tobacco to the United States. While tobacco production increased in Puerto Rico in the short term with the imposition of the U.S. embargo on Cuba, the crop was completely eradicated by the 1970s. In 1997, the agricultural sector in Puerto Rico accounted for only 1 percent of GDP and 3 percent of employment (CEPAL 1997). The decline of the Puerto Rican agricultural sector can be attributed to a number of reasons such as soil erosion and inefficient production practices, but the crucial reason is considered to be to the Puerto Rican government’s incentives toward industrialization (as well as the ensuing trend towards urbanization). These incentives pulled resources away from agriculture, raised manufacturing wages and made agriculture a less attractive employment and investment option (Taylor and Thompson, 1992 a and b). Puerto Rico’s trade in agricultural and food products has been characterized by a perennial trade deficit (Alamo, no date) Though the general decline in this sectors is expected to continue, there are a number of niches that have been identified for export growth such as tropical fruits and those were technology can be easily transferred (e.g., tomatoes for the U.S. winter market). These sectors would be most affected by the end of the U.S. embargo, however, since Cuba was a traditional supplier of these products to the U.S. market and could easily develop a competitive advantage again (Alamo, no date). Though Cuba’s agricultural sector suffered a drastic decline as result of the revolutionary government’s policies (Kost 1998), the sector is starting to recuperate, and a number of commodities will likely be exported from Cuba to the United States once the embargo is lifted. According to a joint University of Florida-University of Havana study quoted in a report from the Foreign Agricultural Service (1999), these would be: sugar, citrus, vegetables, tropical fruits and fisheries. Some of these products are likely to find themselves on Puerto Rican supermarket shelves. It is also likely that Puerto Rican agricultural producers would create joint ventures with Cuban growers for production or processing of foods. Agricultural sales to Cuba from the United States are estimated to be U.S. $300-1,000 million in the first post-embargo year alone. U.S. exports would likely be concentrated around rice, grains, beans, wheat and animal products. In addition, the production of Cuba crops mentioned above would require imported inputs such as fertilizers, oil and machinery. Unfortunately, Puerto Rico is not strong in any of these sectors. In sum, a normalized Cuba is expected to add to Puerto Rico’s agricultural trade deficit. The end of the 20th Century is witnessing a considerable amount of change in the political economy of both Puerto Rico and Cuba. For Puerto Rico, the main variables of change involve the resolution of the status question and the impact on the manufacturing base of the phase out of section 936 and of the global rationalization of production. For Cuba, the main variables for change center around the timing and conditions of the end of the U.S. embargo and the rate at which the Cuban government (with or without Castro) is willing to allow a transition towards open markets and, ideally, a more pluralistic form of governance. In terms of regional dynamics, while Cuba is seeking stronger alliances in both the Caribbean and in the hemisphere, Puerto Rico is aligning itself ever more closely with the United States and its hemispheric agenda. This is evidenced by the intensity or paucity of formal and informal relations with regional associations being carried out by Cuba and Puerto Rico, respectively. In a world of globalized competition, the task of making the Caribbean Basin an attractive manufacturing location and a tourism destination, might require the active involvement of Puerto Rico, as either a Commonwealth or a State. As previous studies have shown, the sectors in a postembargo Cuba that held the most interest for the Puerto Rican and Cuban business people interviewed were: professional services, construction, manufacturing, small- and medium-sized business, tourism and agriculture. The analysis revealed that while most sectors should provide excellent opportunities for Puerto Rican firms and a win-win scenario, the tourism and agriculture sectors could provide a threat to Puerto Rico. Forestalling negative impacts and fully taking advantage of the opportunities that Cuba will present will require private and public sector cooperation in a number of ways: (1) the tourism offering must be continuously improved in order to provide more value to visitors and a possible base of differentiation from the Cuban market; (2) the possibility of longer term multiple destination packages should be developed and efforts to capture the European market should be initiated; (3) an attractive manufacturing environment should be maintained through either new incentives and/or improved infrastructure and corporate efficiency; (4) Puerto Rico managers of U.S.-owned large manufacturing companies, hotel chains and professional service companies should start lobbying headquarters for Cuban expansion plans that include a Puerto Rico base; and (5) the competitiveness of Puerto Rican exports should be improved through the continuation of current efforts to export to new markets. Plans to update the 1994 Government of Puerto Rico study is certainly one step in the direction of achieving the goals outlined above. However, one can only study a market so much. There are many good reports available in the U.S. that accurately specify Cuban opportunities that can be matched to Puerto Rican strengths. What will be needed as a complement to this analysis are trade missions and individual company visits aimed at developing firm specific contingency plans such as the memorandums of understanding that many U.S. firms have signed. Alliances and joint ventures with companies currently on the ground in Cuba should be explored within the parameters of the embargo as well as participation in the plans of U.S. firms with actionable contingency plans. Perhaps then, Cubans and Puerto Ricans can finally go beyond relating to each other as cold war warriors and start becoming business associates. 1. This paper is an excerpt from a larger work by the same authors entitled Cuba and Puerto Rico: From Cold War Warriors to Business Associates. 2. The authors wish to acknowledge the Canadian Foundation for the Americas (FOCAL) and the Center for International Business Studies (CIBS) at Dalhousie University for their generous support of this project. We would also like to express our gratitude to all of the individuals that assisted with this research investigation as either interviewees or reviewers. In particular, we would like to thank Evaldo Cabarrouy of the University of Puerto Rico, John Collins of Caribbean Business and Gerardo González Núñez of the Inter- American University in Puerto Rico. 3. This well known and oft quoted verse was written by Lola Rodríguez de Tío, a Puerto Rican poet who was exiled to Cuba by the Spanish government in the early 1900s for her political and revolutionary ideals. 4. See White (1959) for a comparative study of the development paths followed by Cuba and Puerto Rico up to 1959. 5. A program initiated in 1986 with the aim of promoting development through private sector initiatives. 6. See also Klinger in Hasham, ed. (1997), for an outline of Cuba’s perception of the possibilities of re-integration the Caribbean. 7. See Collins (1996 a and b); US-Latin Trade (1993): Dávila (1999). 8. For example, Business And Investment In A Free And Democratic Cuba Conference, Caribbean Latin America Action, Puerto Rico, May 1995; and New Waves in the Caribbean Conference, New Waves Foundation, San Juan, Puerto Rico, June 12-14, 1997. 9. See Alegría, Cué and Vélez (1992) and Cabarrouy and Cué (1993). 10. See Paternostro (1999) for a good description of Cuba’s music industry. 11. Though they are not always successful in obtaining visas. 12. See Tamayo (1999); Cotayo (1999); and Bussey (1999). 13. See Collins (1999); Casellas (1999); and Díaz (1999). 14. Section 936 of the U.S. Internal Revenue Code (the Possessions Tax Credit) grants industrial tax incentives and other incentives to U.S. companies based in Puerto Rico. 15. Though mining and fisheries are important sectors in Cuba, they are not important ones in Puerto Rico and have, therefore, been excluded from this analysis. 16. For example, Puerto Rico-based U.S. firms that export outside of the U.S., can maintain some incentive though existing tax regulations. A new set of industrial incentives is being presented to the U.S. Congress in 1999. One of these incentives would make permanent the tax credit incentives of Section 30A, and the other would extend to Puerto Rico research and development credits (Mulero 1999). Local regulations have also contributed to a positive business environment, for example, new regulations have expanded the areas designated as free zones.